“Driveways to Highways” is the company motto for Heartland Asphalt, Inc. based in Mason City, IA where the dedicated employees are a big family, hard work is the norm and continually changing to improve the company is part of daily life. Heartland Asphalt was founded 1991 with George Jessen serving at its first President and General Manager. George still holds that position today, but how he got to that position was hard work and the willingness to change and expand. George Jessen started in the road construction business as a “summer intern” with Weaver Construction in 1983 while attending ISU for Construction engineering. Upon graduation, he moved to Chicago and spent a year in vertical construction. In January 1985, he returned to Iowa to join Weaver Construction full time. Dave Ricken, Heartland Asphalt, Inc., Vice-President had also worked as a summer intern and started full time with Weaver Construction at the same time. Weaver Construction was sold to Martin Marietta Aggregates in 1986. George continued in the business with Martin Marietta until the end of 1989 when the company made the decision to divest of their asphalt and trucking business, which he managed. George then joined Fred Carlson Company of Decorah and helped facilitate the purchase of the asphalt business from Martin Marietta. He opened an office in Mason City and the first year the company operated under the Fred Carlson name. Later that year Dave Ricken re-joined George and they have worked side by side ever since. In 1991, they created a separate corporation and Heartland Asphalt was born. In April in 1997, George purchased controlling interest of Heartland Asphalt, Inc. from Fred Carlson Company Management and included Dave Ricken and four other managers in ownership. Mason City serves as the hub for Heartland Asphalt, Inc., but we also work in over 20 North Central Iowa counties. We complete over 300 contracts per year from small driveways to interstate highways, bike trails and grain pads to city streets and parking lots. 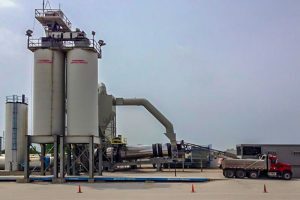 Heartland Asphalt Inc. also performs pavement maintenance such as patching, crack filling, seal coating, and produce all of our Hot/Warm Mix in our multiple asphalt plants and test this mix in our two bituminous testing labs. Our strengths are within our people, the ability to build asphalt pavements with proper drainage and structure to carry the anticipated loads. We utilize the latest technology to grade and shape our projects, place crushed stone base, concrete curb and sidewalks, and asphalt pavements. Like many companies, Heartland Asphalt Inc. is constantly changing as the industry and needs change. One thing that stays the same is the dedicated employees that work hard and have helped make the company what it is today. Over the years Heartland Asphalt, Inc. has grown from 25 to 85 employees. We also hire several owner/operator trucks on a daily basis to supplement our trucking needs. Investing time above and beyond projects is something Heartland Asphalt, Inc. feels very strongly about. We have always been active in our communities because it is the right thing to do, and it has been nice to be recognized by the AGC with their Bravo Award every year since 2000. The family setting in the workplace, dedication to the industry, and love of construction we hope will make Heartland Asphalt an industry leader for years to come. Heartland Asphalt continues to use technology to enhance our quality and productivity. Even though we work in a mature industry, there is a constant need to refine our processes and as Steve Jobs said “Think Differently”.